AMSOIL SEVERE GEAR® Synthetic Extreme Pressure (EP) Lubricants are premium grade gear oils specifically engineered for maximum performance in severe duty applications. These state-of-the-art AMSOIL formulations feature an exclusive blend of high viscosity, shear stable synthetic base oils and an extra treatment of high-performance additives. AMSOIL SEVERE GEAR® Synthetic EP Lubricants maintain their viscosity for long-lasting protection against metal-to-metal contact. The proprietary AMSOIL additives form an iron-sulfide barrier coating on gear surfaces, providing the ultimate line of defense against wear, pitting and scoring. AMSOIL SEVERE GEAR® lubricants help prevent “thermal runaway” — a phenomenon caused by a lubricant’s inability to control friction and increased heat under high-stress conditions. By controlling thermal runaway, AMSOIL SEVERE GEAR® Synthetic EP Lubricants inhibit rapid lubricant degradation and component damage. 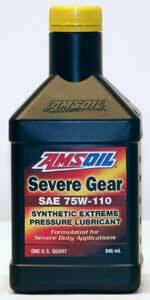 Equipment runs better and lasts longer with AMSOIL SEVERE GEAR® Synthetic EP Lubricants. Higher horsepower, towing and hauling capabilities of modern vehicles make turbo diesel pick-ups, SUVs, vans and delivery/utility vehicles especially prone to severe service. Other severe duty vehicles include light, medium and heavy-duty trucks, buses, heavy equipment, 4X4s, tow trucks, race cars, tractors, and motor homes. Do you want the Specially Designed Pump to easily fill the diff? © 2004 - 2019 Hardtopguy.com LLC. All rights reserved.